The Capri was a sporty coupe built by Ford of Europe (in Germany) and imported to the USA under the Mercury brand. Power came from a variety of V4, I4 and V6 engines mated to the rear wheels via manual transmissions for a proper driving experience. 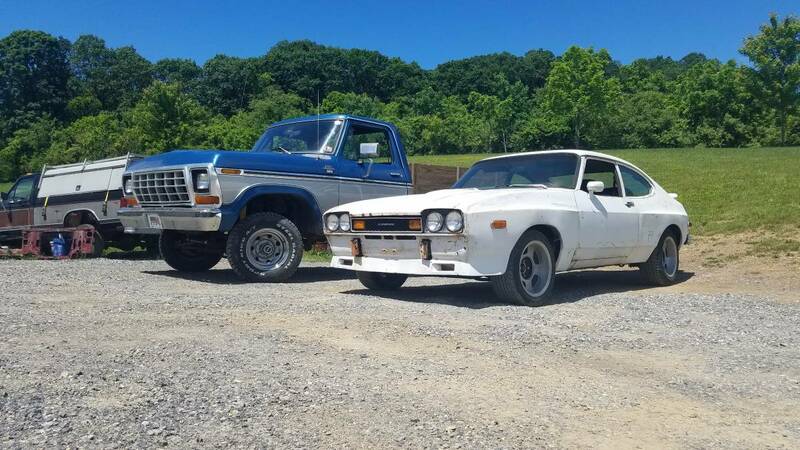 Find this 1977 Mercury Capri RS offered for $3,250 in Middleburg, PA via craigslist. Tip from Cory. 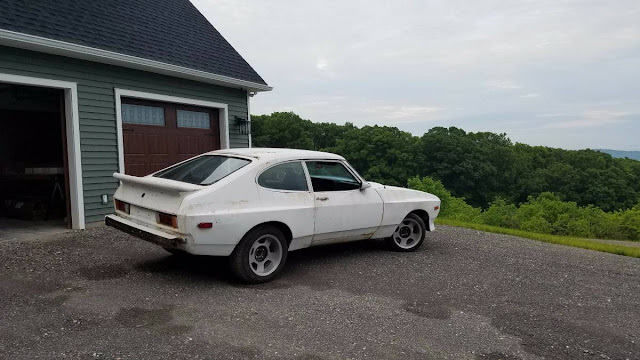 I am selling a 1977 Mercury Capri. The car is an original American Spec car built on Cologne, Germany and imported to the United States for sale. It is a 2.8 long block car with the original 4 speed gearbox. The car started life as what was known in America as a White Cat Edition, which is a white car with gold pin striping and wheels, making the car rare to begin with as many special editions sold were Black Cat Editions. Though the characteristic White Cat options are log gone of covered, the VIN is still a valuable item. The car was sold here and during its life time has had some modifications done to it. A previous owner bought an English only RS wide body kit and had it shipped over from England. The kit is one of roughly 50 produced stamped with the ford logo in all 4 fenders and the front chin spoiler. The kit also included a whale tail rear spoiler that has been put on the rear hatch. The car also has a steering wheel sourced from a French version of the car. These additions make a rare car to begin with, what could be a one of one car, built entirely with OE parts minus the wheels. The interior of the car is almost perfect, with an original A/C dash, though the A/C is long gone. The only issues are a small tear in the drivers seat, and the bottom of the steering column/dash piece is missing. 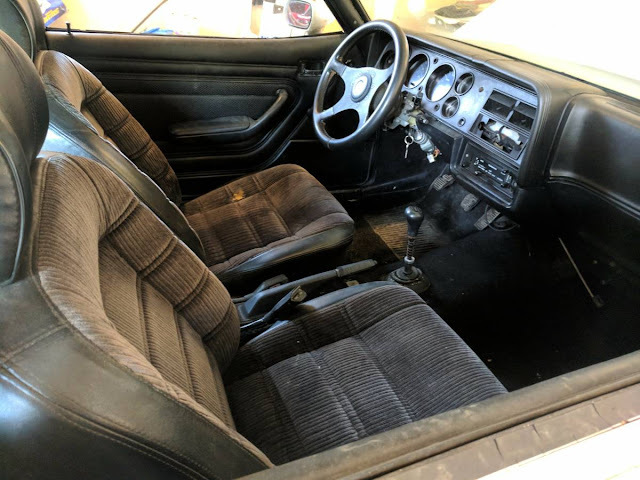 Overall the car is fairly solid but contains some rust as can be expected on a 40 year old car, which brings me to the list of things wrong with the car. Rust is present in a quarter sized hole in the trunk floor and passengers floor, the backs of the headlight buckets, and in the A-pillar door jamb. A previous owner had attempted to install a fuel injection system off of a 2.8injection car from over seas. The system required the install of the Euro spec cylinder heads to work with the fuel injection. This means there is only 2 exhaust ports per bank of cylinders, which is only an issue as one exhaust manifold gasket is broken and a replacement cannot be sourced in the US. The fuel injection also required also needed to be wired to the car, which is where the biggest issue lies. 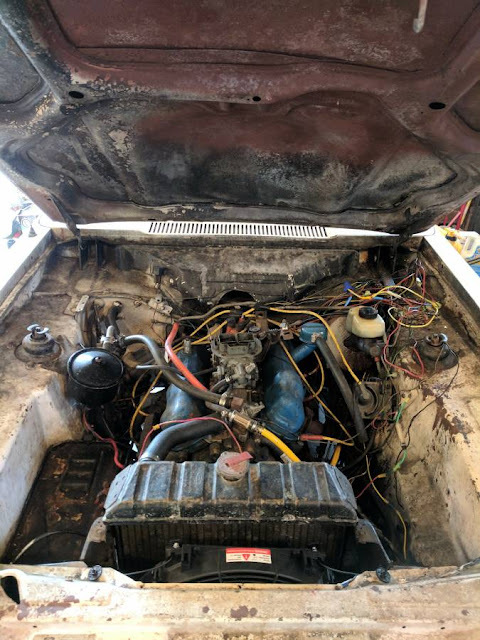 The system was installed, and removed by a previous owner, who left the poor wiring job inside the car when it was swapped back to a carburetor. The wiring should be gone through completely, though is only really effected in front of the firewall and at the ignition switch. The car currently is powered 100% of the time, even when the key is off as the power wire runs directly from the alternator to the fuse panel. The carburetor should also be gone through and cleaned as he car runs, but could use a tune up. A new set of door pins and a factory 1977 wiring harness and all other literature I have will go with the car. I also have the original exhaust back to the mufflers, but is is not attached as one of the rubber hangers broke, so it was entirely removed, and the tailpipes were not on the car when I bought it. Over all it is a solid project car for anyone looking for a car outside of the norm. The could be made drive-able as is, or completely restored for a extremely interesting classic car, few people know exists and an oddity even among other capris. The capri community is filled with wonderful people able to help with any questions that may arise about the car, including Team Blitz, one of the top capri suppliers in the world. Ford made a V-4 but never in a Capri of this era.